These reversible pew cushions combine quality workmanship and a tailored appearance. They can be made to virtually any length and can even be made in perfectly curved sections. Your representative will do all necessary measuring and pattern making. We are responsible for correct fit and sizing. 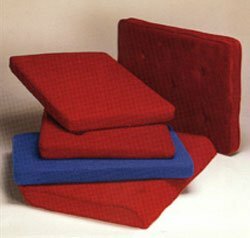 Welting is optional on reversible cushions / standard on modular. Style A – 15″ wide x 2″ thick Slab poly filled Welted edges and zippered. Style C – 15″ wide x 2″ thick Granulated poly filled. Welted edges and tufted. Style D – Wedge-shaped 15″ wide x 2″ thick in rear, tapers to 1″ in front; Slab poly filled. Welted edges in rear only. Style E – 15″ wide x 2″ thick Slab poly filled. Welted edges on diagonal edges tufted. Style F – Same as Style D except has welting on all edges and buttons to maintain welt alignment. We will take it one step further than our competitors. Prior to adding the pew cushions, if any repairs are needed, we can do the necessary work followed by a light refinishing on the wood parts, all done on-site. This process truly brings the look of the pews back to new.